Corticosteroid or steroid injections are commonly used to treat a variety of inflammatory conditions of the upper extremity. 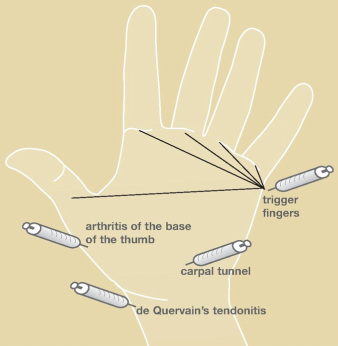 Examples of these include steroid injections for trigger finger (stenosing tenosynovitis), de Quervain’s tendonitis, carpal tunnel syndrome, arthritis, tennis elbow (lateral epicondylitis), and rotator cuff tendonitis (see Figure 1). Figure 1. Steroid injection sites. How are steroid injections performed? The area to be injected is first cleansed with an antiseptic such as an iodine preparation,alcohol, or other skin disinfectant. 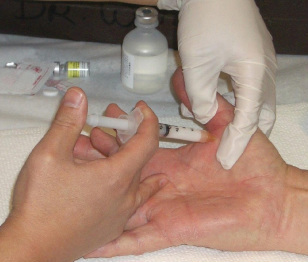 The injection is then given with a small needle (see Figure 2). Typically, only a small amount of steroid and local anesthetic is injected. Afterwards, the area is covered with gauze or an adhesive bandage. Steroid injections should take effect within a few days and the benefits can last for many weeks. The exact timing, however, varies from patient to patient. For some conditions, one injection can be sufficient to completely get rid of the inflammation and pain while for more severe cases, several injections may be required. Most patients respond well to injections although a small subset may not experience any relief of symptoms. Figure 2. The injection is given with a small needle. The most common side effect is known as a cortisone flare. This is thought to happen when the steroid crystallizes after being injected. In patients who experience a flare, a brief episode of pain lasting one or two days follows the injection. This pain can be worse than the initial discomfort for which the injection was given. Cortisone flares resolve spontaneously over a few days and can be treated with ice and immobilization. Another common side effect, especially in patients with darker skin, involves skin discoloration at the injection site. The skin becomes locally lighter in color and sometimes thinner. Although this can improve, the whitening of the skin can sometimes be permanent. One of the more serious complications from steroid injections is an infection, especially if the injection was given into a joint. Fortunately infections are rare and can usually be prevented by carefully cleaning the skin before performing the injection. Very rarely, some patients may experience allergic reactions to the steroid or local anesthetic in the injection. Patients with diabetes will often notice a transient increase in their blood glucose in the days following a steroid injection.